Whilst working as a writer and PR agent in the fashion, beauty and hair field, I developed a real love of experimentation with cosmetics and hair styling. I also gained a deep appreciation of the difference that beautifully applied makeup and well styled hair can make, both to a person’s appearance on and off camera, and to their self-confidence. 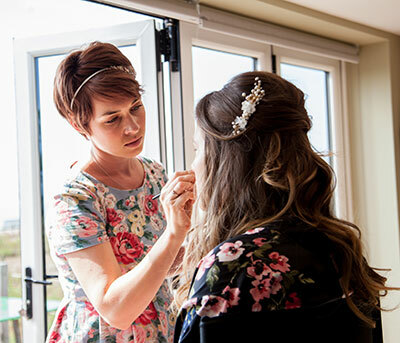 Working as a freelance makeup artist and hair stylist seemed a natural progression of my skills and thus Blush!, based near Hastings and mainly covering East Sussex, Kent, Brighton and Hove, was born. 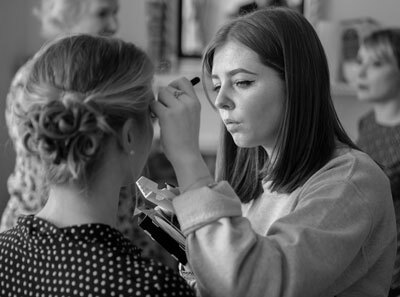 Having completed makeup and hair styling courses at London’s Rouge Makeup School and Beauty Call, I offer bridal, prom, special occasion and photo shoot makeup and hair styling as well as one-to-one and group makeup lessons. In my years working as a makeup artist, I have come to realise that beautiful skin is the most important component in any makeup, and a flawless but natural, glowing and fresh complexion has become my signature look. With this in mind, and always keen to expand my knowledge and skills, in 2018 I undertook a facials course at The Beauty Barn Academy and am excited to be offering facials using the science based, results driven brand that is DermaQuest. Have a look at my Facials page for more information on the brand and the treatments I offer. I am originally from Hertfordshire but from the ages of 11-19 lived in the south of France. I then moved to London where I started assisting established makeup artists and hair stylists on various fashion shoots on magazines such as Vogue, Grazia, Look and ES magazine as well as taking on other jobs including photoshoots for press releases, presentations for London Fashion week, commercials and video games. After two years, I decided to take the plunge and enrolled in a private, five week intensive course in Fashion, TV and bridal makeup at DFMA in Brighton. I am now working alongside Penny, covering weddings, special occasions, proms, makeup lessons, photoshoots and fashion work in the London area.